Sekrax Melgoy had the voice of an an angel, everyone agreed. Hearing him talk or sing was ecstasy. However this not his story. Zygor Honlock made filters for, and assembled the cults’ supply of gas masks. And the one time he screwed up, his one mistake, was in Sekrax’s mask during a raid in a Nurgle infested agri-world. Sekrax survived, but his voice was ruined by the noxious gases encountered there, thenceforth sounding like Tom Waits gargling sandpaper. As punishment it was ordained that Zygor never speak again; to that end he’s been bound with a similar punishment as Varbhor. Like most of the cult Zygor’s biggest desire is to curry the favor of Slaanesh. Before his sentence of silence he lead a small group of cultists who’d found some ancient texts on philosophy. 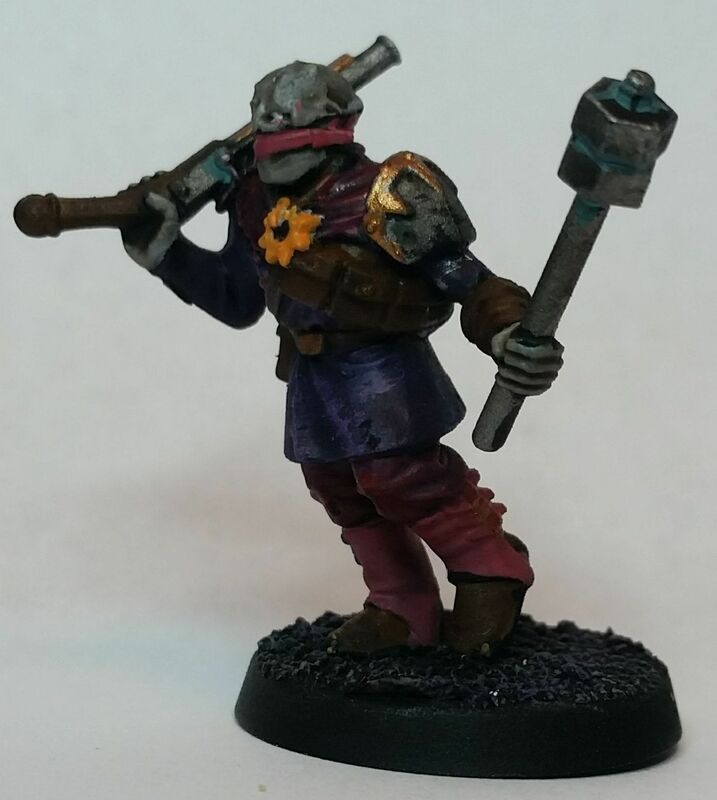 As such they’d devoted themselves to the pursuit of excellence, for surly the more perfect they became the greater the chance Slaanesh’s gaze would fall upon them. While he can no longer participate in the debates, he still attends and listens. In addition he is one of the best shots with a pistol in the cult, able to hit a target half again as far away as most marksmen. Finally Zygor is also a collector; several years ago he came across an ancient miniatures game called CrimeHive. According to the rules the miniature robots and monsters would move on their own, fighting battles as directed by the players. However the ravages have time have not been kind to the sparse selection of models Zygor has found, and while most are in decent condition the electronics inside have long since corroded to the point of being unsalvageable. The are several other cultists who are willing to play his modified rules where they use measuring sticks and dice to determine the outcome of battles, but little would please Zygor more than finding some perfectly preserved pieces with functioning electronics so that they could play the game properly. This entry was posted on Friday, November 3rd, 2017 at 8:30 am	and is filed under Meet the Cultists. You can follow any responses to this entry through the RSS 2.0 feed. You can leave a response, or trackback from your own site.